(23456.4, Jessie Morris Postcard Collection, OHS). Located in Kay County, Newkirk is situated on U.S. Highway 77, eight miles south of the Kansas-Oklahoma border. The town was platted in 1893 by the federal government as the county seat of "K" County and was originally named Lamoureux, for Silas W. Lamoureaux, commissioner of the general land office. Settlers arriving on September 16, 1893, the day of the Cherokee Outlet land run, were unhappy with the town name and chose the name Santa Fe, to entice the railroad to build a depot there. Neither the railroad nor the post office would accept the name. The citizens held an election on November 8, 1893, and chose the name Newkirk in another effort to appeal to the railroad. The name was derived from Kirk, a small cattle-shipping depot located two miles directly north of present Newkirk on the Atchison, Topeka and Santa Fe Railway line. 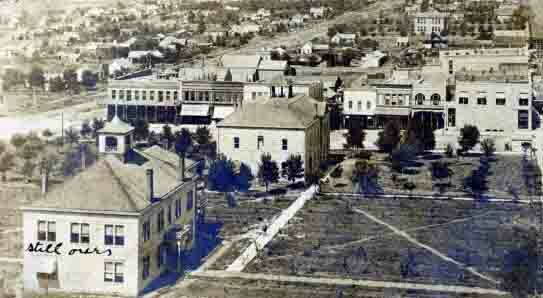 Citizens elected a provisional city government on September 18, 1893. Those elected were N. L. Bowman as mayor and Porter Willis Smith, a banker from Udall, Kansas, as treasurer. When asked to give a speech, Smith facetiously responded, "I shall keep no more than twenty percent of the funds for myself." Newkirk grew rapidly. The first edition of the Newkirk Republican, which appeared on November 24, 1893, listed twenty-seven professionals and businesses, including two restaurants, four saloons, two meat markets, a lumberyard, and three banks. Within two months the community boasted 247 businesses. By 1901 the downtown area had twenty imposing stone structures, most of them built of native limestone quarried east of the community. In 1984 the Newkirk Central Business District was added to the National Register of Historic Places (NR 84003079). According to population, Newkirk is one of the smallest communities in Kay County. The original site chosen by the government for the county seat was approximately six miles southeast, at the location of Kildare. However, Cherokee allotments awarded in the Cherokee Outlet were chosen with townsite development in mind, causing the government to move county seat sites and to keep their location secret until the land opening. After the opening both Ponca City and Blackwell were intent on obtaining designation as county seat. As the possibility of statehood approached, the question regarding the county courthouse location reemerged. According to Newkirk's mayor, Porter W. Smith, Blackwell had been "hungering and thirsting for a county seat" since its early days. At the 1906 Oklahoma Constitutional Convention Blackwell representatives lobbied intensely for a division of Kay County into two separate counties so that Blackwell could be the seat of the new county. This effort failed, however, and on September 3, 1908, an election to relocate the county seat was held with the following results: Blackwell, 2,083 votes; Newkirk, 2,063; Ponca City, 1,388. A runoff election was held on December 2, 1908, and Newkirk emerged the winner. Gov. Charles N. Haskell proclaimed Newkirk to have been "duly and lawfully selected as the county seat" as provided by law. Unsatisfied with the decision, Blackwell filed a suit, but Newkirk was again the victor. The first courthouse, a wood-frame building, burned in March 1897. A second courthouse, completed in July 1897, served county officials until the present stone courthouse (NR 84003070) was dedicated on October 28, 1926. At 1907 statehood Newkirk had 1,778 residents. During the early 1900s oil wells were drilled in the vicinity, and the population peaked in 1920 at 2,533. The population remained constant at around twenty-one hundred for several decades, fluctuating to 2,413 in 1980 but dropping to 2,168 in 1990. In 1992 Newkirk became Oklahoma's first small town to receive the Oklahoma Main Street award. At the turn of the twenty-first century Newkirk, with 2,243 citizens, had a council-manager form of government and served as a commercial center for nearby farm families. The Newkirk Heritage Center housed early day artifacts and photographs. The 2010 census counted 2,317 residents. Marijane Rupe Boone, ed., Newkirk and Kay County Diamond Jubilee (Newkirk, Okla.: Newkirk and Kay County Diamond Jubilee, Inc., 1968). Karen Dye, Newkirk: Carved in Stone (Stillwater, Okla.: New Forums Press, 1993). "Newkirk," Vertical File, Research Division, Oklahoma Historical Society, Oklahoma City. North Central Oklahoma: Rooted in the Past—Growing For the Future (Ponca City, Okla.: North Central Oklahoma Historical Society, 1995). Karen Dye, "Newkirk," The Encyclopedia of Oklahoma History and Culture, https://www.okhistory.org/publications/enc/entry.php?entry=NE012.